The 146AE from GRAS sets a new standard for automotive measurement microphones. Now all your NVH test challenges can be solved with just one microphone which is flexible, precise and rugged. It is designed specifically for the demands of automotive testing and can perform accurately and durably under the most extreme test conditions time and time again. This minimizes costly re-testing and rescheduling, providing efficiency, valid data and high performance all at the same. The focus has been on ensuring that the 146AE performs in real-life conditions such as strong vibrations, drop, extreme temperatures and water or dust. Ideal for engine compartment measurements, transmissions, exhaust and brake noise tests. These conditions are all verified during our Highly Accelerated Lifetime Test. The 146AE is a rugged free-field microphone set for all acoustic applications where the microphone can be pointed directly at the sound source. It is optimized for use in harsh environments at temperatures from -40 to 125°C. 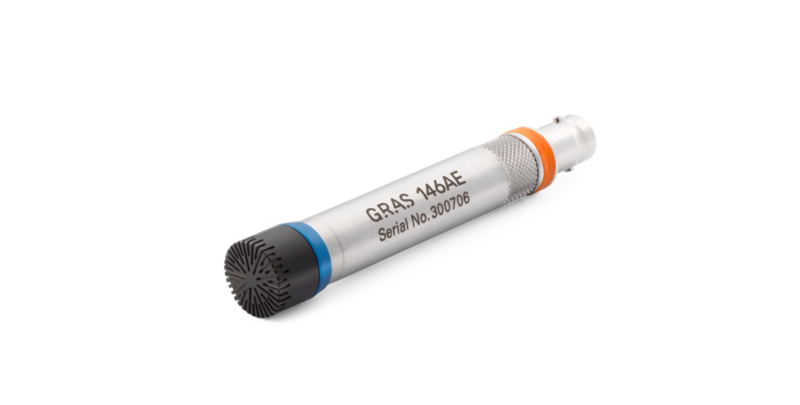 GRAS 146AE is a rugged microphone specifically developed for harsh environments like Automotive testing. It combines the high precision and stability of a laboratory microphone with an unprecedented level of ruggedness, i.e. ability to work properly under adverse conditions such as shock, high temperatures, moisture, water spray, oil mists and dust. With the accuracy of an IEC 61094-4/WS2F measurement microphone and ruggedness combined in one microphone you can now use a state of the art microphone that provides the advantage of quality and stability over an extended period of time, even when subjected to rough conditions. You can make critical quality measurements without having to replace the microphones, and in this way enhance the confidence in your measurements while at the same time minimizing downtime and maintenance costs. Not having to reconfigure the measurement setup again and again reduces costs and makes measurements easily comparable. This microphone is specifically designed to resist vibrations, shock and drop, and to produce accurate and repeatable measurements under harsh conditions. Application specific test fixtures, cables and accessories ensure easy positioning and handling. An integrated PowerOn LED indication shows when the microphone is connected and ready to measure. If there is a faulty connection the LED will not be lit during power up. Finally it will light up when the TEDS chip is read. This feature makes it possible to run a full "are we ready to measure?" test of all connected microphones by sequentially activating their TEDS. The 146AE is IP67 rated. All exposed parts are protected by water and oil repellent coating, which also is easy to clean. The coating can withstand heat and chemicals. In addition to the microphone set's basic resilience against shock, dirt and moisture a replaceable protective grid with water and dust filter adds an extra layer of flexible protection, including protection against high-velocity particles. This makes the microphone specifically well suited for high humidity, oil splash or outdoor measurement conditions. Simply replacing the filter-grid assembly will add to the time the microphone set can be mounted in the same test configuration. The 146AE has the same low temperature coefficient as a standard measurement microphone set as for example GRAS 46AE, but can withstand permanent exposure to temperatures from -40 to 125°C with no permanent change to its sensitivity. At GRAS we know that in order for you to trust your measurement results, signal quality, stability and robustness are essential. And because we also know how you handle and use the microphones in your daily work, we conduct a series of Highly Accelerated Lifetime Tests (HALT) to make sure that they perform under real life conditions. For the new rugged line of microphones, we have made our HALT even more challenging to reflect the extreme harsh environments and conditions in NVH measurements. It is vibrated for 60 hours at 8g, kept in temperatures varying from -40°C to +125°C , dropped horizontally and vertically from 150 cm on a hard surface and put through a tumbling test randomly falling 100 cm on a floor 100 times. Furthermore, the 146AE is certified water and dust-proof (IP67). The 146AE is a free-field microphone set designed for use in rough conditions such as NVH testing in the automotive industry. The GRAS 146AE is a high-performance 1/2” Constant Current Power (CCP) free-field rugged microphone set. As a CCP type microphone set it ensures simple cabling and stable connection setup, reducing costs. CCP connection standard is at the same time interchangeable with accelerometers and pressure sensors, giving a low multi-channel cost for combined Automotive and NVH testing. The microphone set is a tightly sealed unit, and all exposed parts are protected by a water and oil repellent coating. New methods and materials have been used for the interior of the microphone to improve its ability to absorb shock and vibrations, while the microphone housing is still made by the same well proven type of stainless steel that is used for our standard measurement microphones. The diaphragm is more robust than what is usually used in measurement microphones. This, in combination with the coating, makes it easier to clean the diaphragm without damaging it. The diaphragm can be replaced during repair, keeping repair cost to a minimum. The microphone grid is made from special materials and furnished with a coating, and especially robust to drop and scratches. New materials and mounting methods have been used for the preamplifier section, making it more resistant to being dropped repeatedly. The microphone has two venting holes, reducing the risk of water or oil drops from blocking the venting. The venting holes are protected by a unique filter, and the measurement set is IP67 rated. Together with a GRAS BNC coax cable with waterproof sealing, your whole measurement setup is IP67 rated. The ruggedness of the basic microphone set is further enhanced by the replaceable, special shock absorbing protection grid with an integrated filter that protects against oil, moisture, dirt and high-velocity particles. 146AE is a free-field microphone. If you need to use it in a random incidence sound field, the RA0357 Random Incidence Corrector will change the response up to 10 kHz to diffuse field. Read more here. The 146AE has a two-stage shock protection system. A special built-in shock absorber prevents minor and medium shock impacts from damaging the microphone. If subjected to a high impact shock, the protection grid will absorb the shock by deforming. The grid is scratch resistant and comes with protective coating. The grid has a slightly larger diameter than the grids used on standard microphone sets like the GRAS 46AE, and therefore a dedicated calibration adapter is required. This adapter is part of the delivery. The grid has an integrated filter that is made from an acoustically transparent mesh. This mesh offers protection against dust, dirt and high-velocity particles. It is water and oil repellant while remaining acoustically transparent. This filter protects the microphone in environments where very high humidity or direct water spray is present. It also protects against condensing. The filter is IP55 rated. The 146AE comes with adapters for GoPro™ mounting. In this way you get a vast variety of mounting options using widely accepted mounting methods, e.g. Picatinny. The comprehensive precautions we have taken to make the 146AE immune to adverse test conditions result in a number of benefits that all translate into low costs of ownership. The total life span of the microphone set will be many times that of a conventional microphone set that must be discarded due to damage from dirt, moisture, shock and vibrations. The same microphone set can remain mounted in a test configuration for extended periods of time. Separate test results are immediately comparable because the same stable microphones are used. The protection grid with its protective filters can easily be replaced, for example before dirt and oil fog are clogging the meshes. The CCP (Constant Current Power) technology allows for low cost per measurement channel. Combining these advantages you will obtain a lower cost of ownership, while at the same time enjoying the accuracy and stability of a laboratory microphone. This is also due to lower failure rates and improved productivity due to easier handling and control of your measurement setup. The 146AE conforms to IEC61094-4/WS2F, it is terminated with a BNC connector and requires a constant current of 2 mA. Ready to use standard coax cable assemblies of various types and lengths or waterproof, heat and chemical resistant cables are available. The 146AE is IEEE 1451.4 TEDS v. 1.0 compliant. If your measurement platform supports Transducer Electronic Data Sheets you will be able to read and write data like properties and calibration data. The integrated PowerOn indication and the functionality of TEDS are very useful to determine which microphone is connected to which input channel. However, it is not a check of whether the microphone is within specifications or not. For daily verification and check of your measurement setup, we recommend using a sound source like the GRAS 42AG Multifunction Sound Calibrator with the calibration adapter that is part of the delivery. For proper sensitivity calibration we recommend using a reference sound source like the GRAS 42AP Intelligent Pistonphone. Calibration Data for each individual microphone set can be accessed online via the serial number. In this way, you can easily download and configure your analyzer with calibration data. When our R&D team develops a measurement microphone, it must undergo the most demanding tests to prove that it can withstand our customers' daily test conditions. Using a series of Highly Accelerated Lifetime Tests (HALT) we ensure that our microphones live up to the high quality and precision that our customers have come to expect and trust. Our HALT tests actively accelerate the lifetime of a microphone by simulating the handling and use it is exposed to in real life situations. By stress testing to the limits we have been able to optimize the design for robustness and stability. GRAS Traceable Calibration is a traceable calibration performed by trained personnel under controlled conditions according to established procedures and standards. This is identical to the rigorous calibration that all GRAS microphones are subjected to as an integral part of our quality assurance. GRAS Accredited Calibration is performed by the GRAS Accredited Calibration Laboratory that has been accredited in accordance with ISO 17025 by DANAK, the Danish Accreditation Fund. If you want a new microphone set delivered with an accredited calibration instead of the default factory calibration, specify this when ordering. All parts are manufactured and assembled at the factory in Denmark by skilled and dedicated operators in a verified clean-room environment. Thanks to the high quality, our warranty against defective materials and workmanship is 5 years. Power supply min. to max. **International Protection Marking, IEC standard 60529. ***IP67: Totally protected against dust, protected against the effect of water of up to 1 m of submersion.